Christopher Nolan & Wife Emma Thomas, Danny Boyle: Outrage? 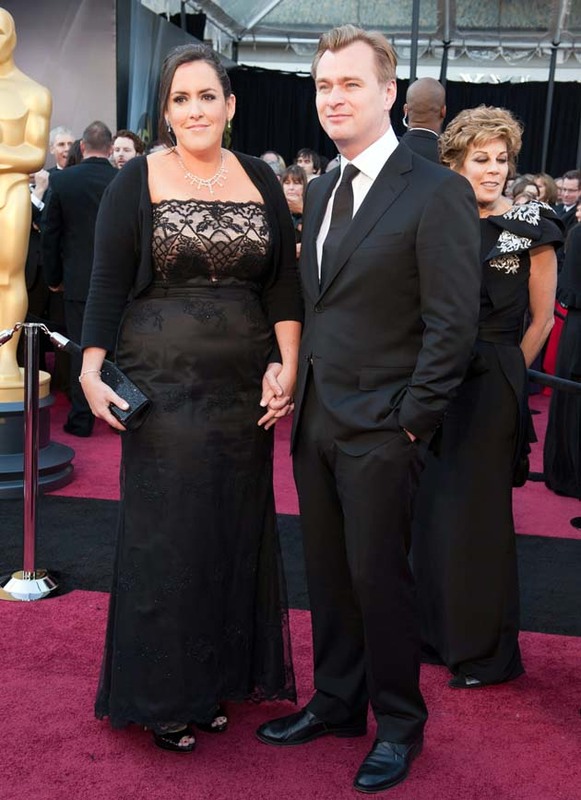 Christopher Nolan and wife Emma Thomas: Bypassed once again for the Best Director Oscar. A very blasé-looking Christopher Nolan, shortlisted as one of the producers of Best Picture Oscar nominee Inception and as the writer of the film's original screenplay, arrives with his wife and fellow Inception producer Emma Thomas at the 2011 Academy Awards held on Feb. 27 at the Kodak Theatre in Hollywood. Darren Aronofsky for Black Swan. Tom Hooper, the eventual winner, for The King's Speech. In case the incredibly successful British filmmaker was disappointed, angered, or downright outraged at being bypassed one more time by the Academy of Motion Picture Arts and Sciences' Directors Branch (see below), one surely can't tell just by looking at the picture above. Of course, there's always the possibility that he just didn't care. Much to his fans' outrage (if not his own), Christopher Nolan was also bypassed two years ago, when his global blockbuster The Dark Knight failed to be nominated in the Best Picture, Best Director, and Best Adapted Screenplay categories. In fact, Nolan has yet to receive an Academy Award nomination in the Best Director category. Inception, toplining Leonardo DiCaprio, is his first Best Picture Oscar nominee. Nolan's next movie is the third and final installment in the Batman trilogy, The Dark Knight Rises. Christian Bale, Anne Hathaway, and Tom Hardy will star. Christopher Nolan Oscar “Snub” May Not Have Been a Snub. Biggest Oscar Snubs: Christopher Nolan & The Dark Knight. Christopher Nolan and Emma Thomas, whose producing credits also include The Dark Knight, The Prestige, and Batman Begins, were married in 1997. Photo of Christopher Nolan and wife Emma Thomas on the Red Carpet: Ivan Vejar / © A.M.P.A.S. Danny Boyle and guest: Bypassed for the Best Director Oscar. Danny Boyle, a double 2011 Oscar nominee as one of the producers and screenwriters of Best Picture contender 127 Hours, is seen above with a guest on the 83rd Annual Academy Awards' Red Carpet outside the Kodak Theatre in Hollywood. Boyle also directed 127 Hours, but like Inception filmmaker Christopher Nolan, he failed to be shortlisted in that particular category. Boyle's fellow nominated producers were Christian Colson and John Smithson. Simon Beaufoy shared credit for the 127 Hours screenplay. At the 2009 Oscar ceremony, Danny Boyle took home the Best Director Oscar for Best Picture winner Slumdog Millionaire, a sleeper hit starring Dev Patel and Freida Pinto, and written by Best Adapted Screenplay winner Beaufoy. Starring Best Actor nominee and 2011 Oscar ceremony co-host James Franco (who shared hosting duties with Anne Hathaway), 127 Hours was not a success at the North American box office. The film, based on a harrowing real-life story, fared better internationally. Ultimately, 127 Hours lost the Best Picture Academy Award to Tom Hooper's The King's Speech. Danny Boyle and Simon Beaufoy lost Best Adapted Screenplay to Aaron Sorkin for The Social Network. And James Franco lost Best Actor to Colin Firth for The King's Speech. 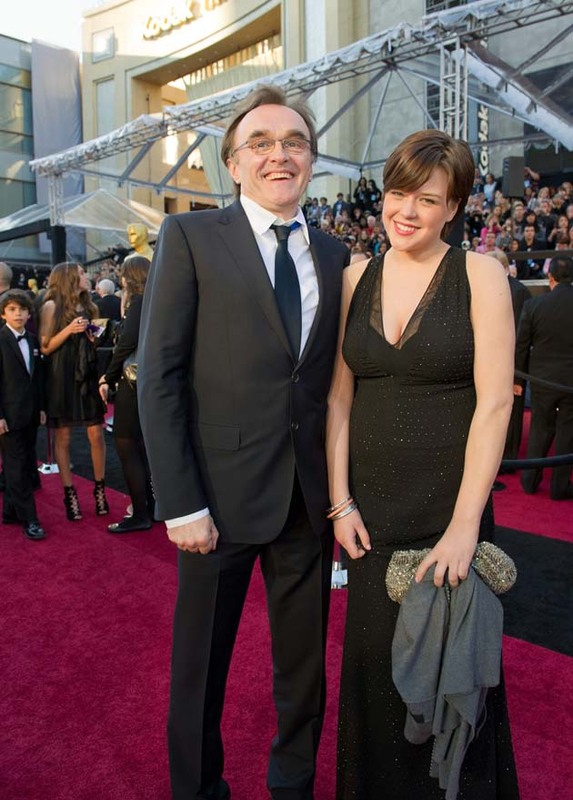 Photo of Danny Boyle and guest on the Oscars' Red Carpet: Richard Harbaugh / © A.M.P.A.S. Jennifer Lawrence: Woman in Red dress at the Academy Awards. Donning a long, red dress, Jennifer Lawrence arrives at the 2011 Academy Awards held on Feb. 27 at the Kodak Theatre in Hollywood. Lawrence was a first-time Best Actress Oscar nominee for her first major film role: a near-destitute, young Ozark woman looking for her missing drug-dealing father in Winter's Bone, Debra Granik's generally well-received indie drama. Winter's Bone also earned nominations for Best Picture, Best Supporting Actor (John Hawkes), and Best Adapted Screenplay (Debra Granik and Anne Rosellini; based on the novel by Daniel Woodrell). Natalie Portman, the eventual winner, for Darren Aronofsky's Black Swan. Jennifer Lawrence photo: Richard Harbaugh / © A.M.P.A.S. Jennifer Lawrence: Oscars' Red Carpet. Cast: Bradley Cooper. Robert De Niro. Elisabeth Röhm. Virginia Madsen. Isabella Rossellini. Edgar Ramírez. Dascha Polanco. Diane Ladd. John Enos III. The Hunger Games: Mockingjay - Part 2 (2015). Cast: Josh Hutcherson. Liam Hemsworth. Woody Harrelson. Elizabeth Banks. Donald Sutherland. Willow Shields. Sam Claflin. Philip Seymour Hoffman. Julianne Moore. Jena Malone. Jeffrey Wright. Stanley Tucci. The Hunger Games: Mockingjay - Part 1 (2014). Cast: Bradley Cooper. Rhys Ifans. Toby Jones. Sean Harris. David Dencik. Cast: Hugh Jackman. Michael Fassbender. James McAvoy. Halle Berry. Nicholas Hoult. Anna Paquin. Ellen Page. Peter Dinklage. Shawn Ashmore. Daniel Cudmore. Omar Sy. Evan Peters. Bingbing Fan. Josh Helman. Ian McKellen. Booboo Stewart. Patrick Stewart. James Marsden. Famke Janssen. Lucas Till. Michael Lerner. Cast: Bradley Cooper. Amy Adams. Christian Bale. Jeremy Renner. Alessandro Nivola. Jack Huston. Michael Peña. Shea Whigham. Elisabeth Röhm. Saïd Taghmaoui. Anthony Zerbe. Colleen Camp. Robert De Niro. Cast: Josh Hutcherson. Liam Hemsworth. Sam Claflin. Woody Harrelson. Elizabeth Banks. Donald Sutherland. Stanley Tucci. The Devil You Know (2013). House at the End of the Street (2012). Cast: Bradley Cooper. Robert De Niro. Jacki Weaver. Cast: Josh Hutcherson. Liam Hemsworth. Woody Harrelson. Elizabeth Banks. Donald Sutherland. Stanley Tucci. Wes Bentley. Cast: Michael Fassbender. James McAvoy. Nicholas Hoult. Kevin Bacon. Rose Byrne. Oliver Platt. January Jones. Jason Flemyng. Álex González. Edi Gathegi. Corey Johnson. Lucas Till. Caleb Landry Jones. Matt Craven. James Remar. Michael Ironside. Jason Beghe. Hugh Jackman. Cast: Mel Gibson. Jodie Foster. Anton Yelchin. Cherry Jones. Riley Thomas Stewart. Zachary Booth. Cast: Felicity Jones. Anton Yelchin. Charlie Bewley. Cast: John Hawkes. Dale Dickey. Garret Dillahunt. Tate Taylor. Cast: Charlize Theron. John Corbett. José María Yazpik. Kim Basinger. JD Pardo. This year, Jennifer Lawrence was the only first-timer among the Best Actress Oscar contenders. Below are her competitors' previous nominations. István Szabo's Being Julia, 2004. Sam Mendes' American Beauty, 1999. In the Best Supporting Actress category for Stephen Frears' The Grifters, 1990. In the Best Supporting Actress category for Ang Lee's Brokeback Mountain. In the Best Supporting Actress category for Mike Nichols' Closer. Baz Luhrmann's Moulin Rouge!, 2001. Stephen Daldry's The Hours, 2002. She won for the latter. * Jennifer Lawrence film credits updated in April 2015. Photo of Jennifer Lawrence as the Woman in the Red Gown: Ivan Vejar / © A.M.P.A.S. Any idea who designed Emma Thomas' dress? What is Melissa Leos birthdate?